FILE - Pope Francis inside the Cathedral Santa Maria del Fiore during his visit to Florence, Italy, Nov. 10, 2015. While Pope Francis' planned visit to the Central African Republic remains uncertain because of concerns over security in that country, the government and people of Uganda, where the pope will visit beginning next Friday, are eagerly awaiting his arrival. The visit to Uganda will be the second by a pope. The first visit of a pope to Uganda and Africa in general was made by Pope John Paul VI on July 31, 1969. John Baptist Odama, Archbishop of the Gulu Archdiocese of Uganda and president of the Uganda Episcopal Conference, said one of the highlights of Pope Francis’ visit is to celebrate the Golden Jubilee of the canonization of Ugandan martyrs by Pope Paul VI in 1964. “He wants to visit the site where the martyrs were burned. The pope wants to visit this place as a continual sign of encouraging ecumenism in our country and in the church in general,” he said. Archbishop Odama said Pope Francis will also meet Ugandan youths and visit the sick and vulnerable. He said the pope will also meet with Catholic bishops of Uganda next Saturday in Ruvaga and address priests, religious and seminaries before leaving Uganda on November 29. 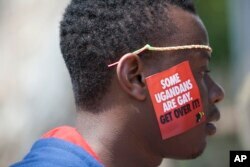 Anti-homosexuality sentiments are high in Uganda. President Yoweri Museveni signed a law in 2014 that not only outlawed homosexual acts, but also compelled citizens to report suspected homosexual activity to the police, triggering increased levels of prejudice, violence and discrimination against the gay community. FILE - A Ugandan man is seen during the 3rd Annual Lesbian, Gay, Bisexual and Transgender (LGBT) Pride celebrations in Entebbe, Uganda, Aug. 9, 2014. In August 2014, a few months after its passage, the anti-homosexual legislation was annulled because it was passed without the requisite quorum, meaning that not enough legislators were present at the vote. Archbishop Odama said he doesn’t know if Pope Francis will wade into Uganda’s anti-homosexual debate during his visit. But Odama said his own personal opinion follows the Catholic Church’s teaching. "Certainly I hold the teachings of the Church that homosexuality practice or encouraging unions is not the correct approach. And those who have this tendency can be treated with respect and the church teaching is to have compassion for them and encourage them to have what we call abstinence,” he said. He said the Catholic Church in Uganda is a vibrant one, and one of the reasons for Pope Francis’s visit is to encourage Ugandan Catholics and to praise God with them. “Certainly the population of Catholics is quite high – 42 percent and the Anglicans are about 36 percent, the Muslims are about 14 percent and the others are for the remaining groups,” he said. With campaigning for Uganda’s 2016 presidential election already in high gear, Archbishop Odama said the Church is encouraging all candidates to stay away from negative campaign and violence. “The church leaders, the religious leaders are constantly advising these politicians to handle this situation with caution, and they must be promoting a more peaceful way of campaigning -- not to incite division, of violence and even aggression of killing or anything of that kind. So we don’t want the politics to be turned into a war,” Archbishop Odama said.